So sad...almost the same age as me....sometimes these celebrity deaths really put my own mortality into perspective! ....On a side note, this seems to be my daily go to spot for death news...probably not how Mike wants to be remembered in his blogging. James Gandolfini was overweight. As I recall from the Raging Storm battles with the Etobicoke Sharks, you're in much better shape. As for these death entries, I'm trying to raise the bar as to who gets an entry. You'll notice Slim Whitman didn't make the cut. @Digger My dad was in great shape and he had a heart attack. Overweight is just one indicator, lifestyle and especially genetics also factor in. By far the best show ever on HBO but still hate the way it ended. 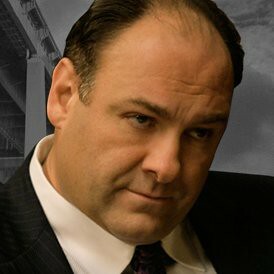 I guess we'll never know if Tony Soprano died in the diner, there will never be a movie and never be closure on a fantastic series. I know this isn't the place for this argument, but The Sopranos isn't the best show ever on HBO. The Wire is the best show ever on HBO or anywhere else. But The Sopranos was brilliant. Loved his work. He will be missed. John Goodman lost a ton of weight recently. Uh huh, turning 50 at Xmas. Mortality indeed. I can't believe he was only 51...he looked older. I would have thought he was in his 60s. He had a very good (though small) performance as a creepy bad guy in "True Romance" that I always remember him for. Always enjoyed his work in The Last Castle as well. The sad part is he had a kid only a couple of years ago. Sad news..I have never seen The Soprano's but I saw him on Broadway a few years back in God of Carnage and he was outstanding. @4x4 Time: If you get the box set and sit down and watch it you will be hooked. The Sopranos, MASH and Seinfeld have been the only programs I ever purposely set time aside to watch in the Prehistoric days of cable and no downloading. I thought he had lost some weight recently? If Argie wonders about John Goodman, where is Rob Ford in the dead pool list? I tried watching the Sopranos countless times... I just could not get into it. I found him more enjoyable in the movie (albeit small) roles that he was cast in. Many pleasant surprises.